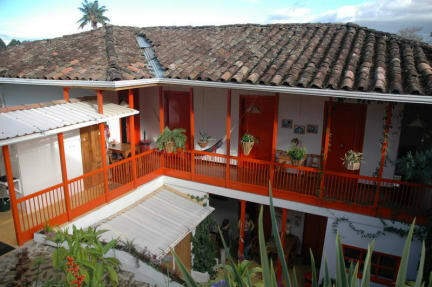 Hostel Tralala Salento is located in a traditional coffee-region house that has been converted into a tasteful, comfortable hostel, just one block from the central town square. 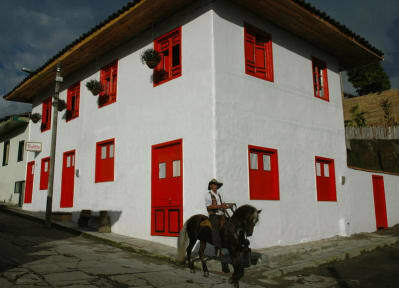 It offers an ideal starting point for the trek to the Cocora Valley or a visit to a coffee farm. With a maximum of 25 guests and lots of different places to relax, there’s a calm, intimate feel to the hostel. We pride ourselves in being a clean, safe, well organized hostel that looks beautiful, has well functioning facilities and with beds that are hard to get out of. There are 2 kitchens in the hostel, one big, one small, but both well equipped with utensils and free coffee and tea, sugar, pepper and oil. Also there’s a patio with hammocks, a lush garden and a cosy TV lounge. We offer a great variety of rooms: with or without private bathroom, for 1 or for 2 persons, a room with a double bed or 2 single beds, your own private studio or a bed in our dormitory. Upon arrival you’ll receive a handy leaflet with up-to-date info about everything there is to do in Salento, including maps, entrance fees, opening times, transportation scedules, recommended restaurants etc. This way you’re sure to make the best of your time in beautiful Salento. It’s a lovely hostel perfectly located in the city centre of Salento. All the buses and Willy’s departure 50m on the main square. The rooms have fantastic beds, blankets and towels :) the showers were one of the best I had on my travel around the country! Beautiful and clean hostal, very central and helpful staff, notthe best hostal to meet new people cause the common area is not used often. Hot showers and good kitchen! A really nice hostel located close to the main plaza of salento. The privat room was bigger then expected with two super comfortable single beds. The two kitchens sind both perfectly equipped and the coffee, salt, sugar and oil are never missing! It’s a quite small hostel, with a nice vibe but at the time also really chilled. The only thing missing is a breakfast option then it would be literally one of the best hostels I’ve been so far! Perfect place to stay in Salento. They provide a two-page pamphlet with all necessary information on travel and activities. Location is perfect with one block away towards the main square. Only improvement would be the lockers which made a little bit of noise when pulling them from beneath the bed while others are still sleeping. Very nice hostal, i felt comfortable there. The twi things that i didnt liked to much: i had a private to the street and it gets noisy very early in the morning (05:30-06:00). I think that is a Problem that comes due to the growth of tourism in salento. And its not so easy to get in touch with other people in the Hostel, because shared outdoor areas are very small. Its a beautiful small hostel with great patio and also good beds. Unfortunatly the atmosphere was quite bad, and it felt not really a social hostel but everyone was doing his own stuff. The staff was ok but Not really friendly.